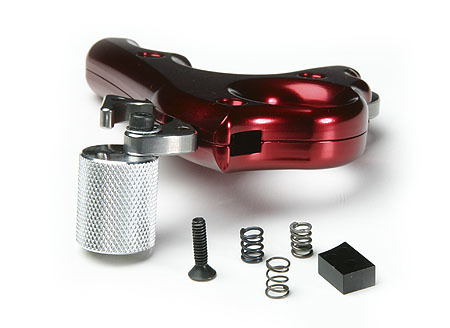 Changing springs to modify the trigger tension is a breeze with the new Interchangeable Tension System. Just remove the lower casing screw, remove the plug, insert new spring, insert plug and screw in the casing screw - then you are all set. There are a variety of spring weights to choose from so you can easily find the perfect tension for your shooting style. I.T.S. now included in most thumb trigger releases; However, check each release description to see the models that do include it. Kits include four thumb spring options and two hex keys. Additional kits available for sale upon request.